Sakai Takayuki Kasumitogi Takobiki 270mm (10.6'') by Sakai Takayuki at Sara Stage. Hurry! Limited time offer. Offer valid only while supplies last. 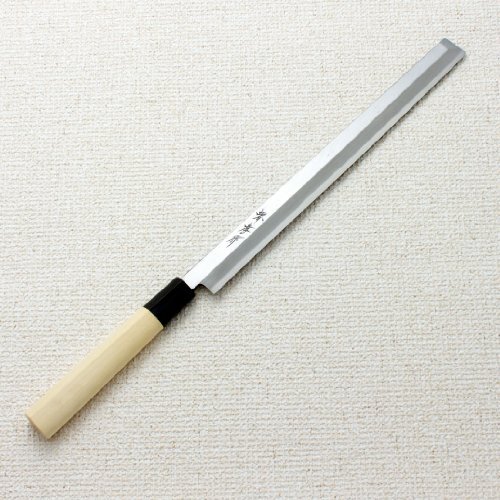 The kasumitogi line is a reasonably priced line of traditional forged knives which work well for first time users as well as more experienced chefs. The kasumitogi line is a reasonably priced line of traditional forged knives which work well for first time users as well as more experienced chefs. These knives are hand forged from Yasuki White Steel in the 'kasumi' method of joining carbon steel and a soft iron jacket. White steel knives hold a good edge and are easy to sharpen. The U shaped magnolia handles and water buffalo bolsters are comfortable and easy to grip, even through long hours of kitchen use. Please note these carbon steel knives are single edged and are designed for right handed users. View More In Sashimi Knives. If you have any questions about this product by Sakai Takayuki, contact us by completing and submitting the form below. If you are looking for a specif part number, please include it with your message.